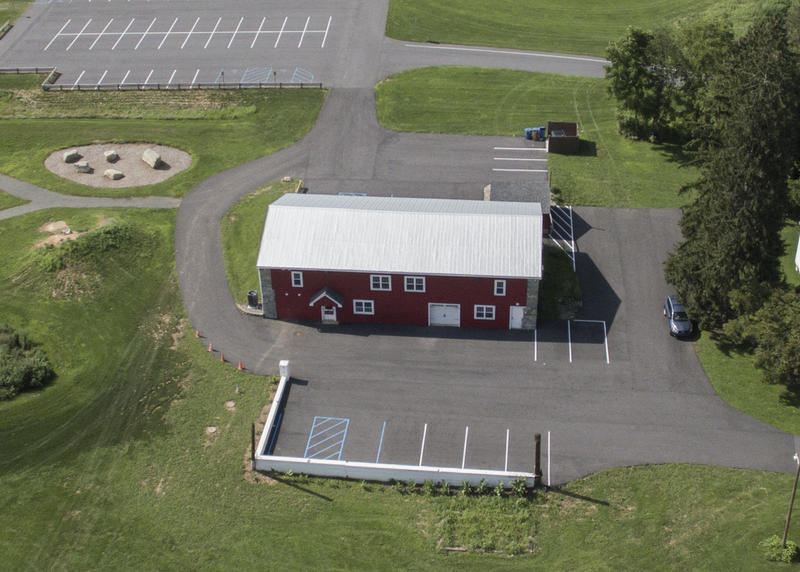 Our new museum was named in honor of historians Ann and Craig Bartholomew for their many contributions to the LMTHS, the Township and the greater Lehigh Valley area. 3120 South Cedar Crest Blvd. Please visit us for the Spring Planting at the Log House in Wescosville instead. "Everything looked very professional and you could tell a lot of work went into the presentations. I was intrigued by the healing method using the red string." - L. S.
"You were able to cover and represent so much in limited space! I loved it. One of my nostalgic moments was seeing all the Trexler Park canned goods! That's all we ever had when I was a little girl." - K. S.
"Wonderful set up in which one could spend hours! 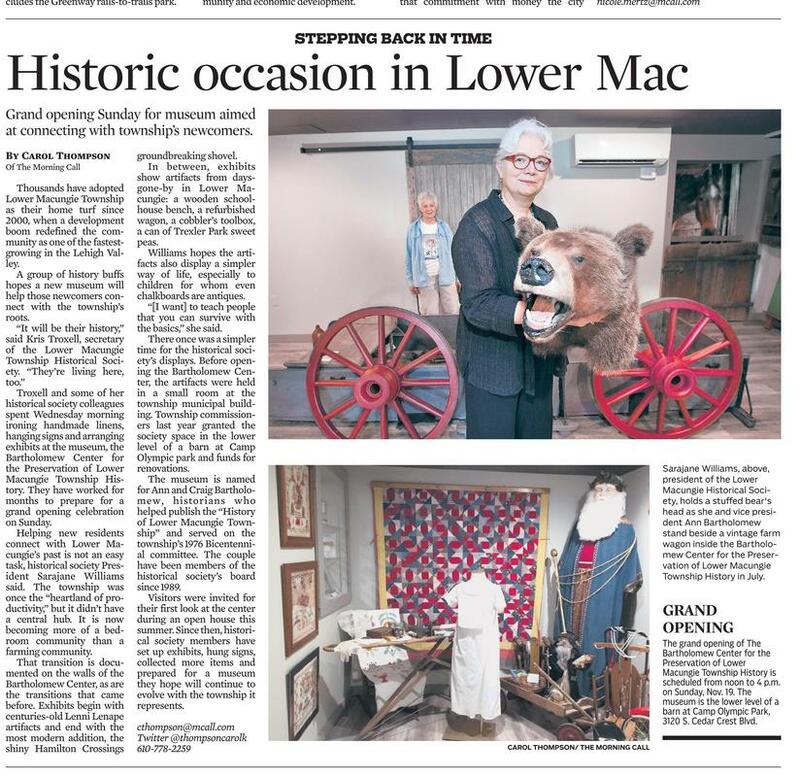 Bartholomew Museum of Lower Macungie Township History is a gift that will keep on giving for generations to come!" - R. R.
"What a wonderful contribution to the community you put together! It was bigger and more beautifully curated than I ever expected it to be." - H. S.
"The museum looked absolutely amazing! I have been in professional museums that didn't look nearly as good! The way things were laid out, the information they provided were just amazing. If you want the true test I will tell you I feel like my son really got a feeling for what life was like for our ancestors which is the most you could ask of any historical society and museum. He asked me questions the entire way home about the family and how they lived in Lower Macungie back in the 1700s and 1800s which was wonderful. He talked all through dinner about what he saw and was so eager to tell his siblings about it. "A tremendous accomplishment! It was far more extensive than expected. I look forward to spending more time there." - R. G.
Now we are able to accept historical artifacts and donations! If you have an item you would like to donate, please Contact us. or send a check to the "LMTHS." old photos from the Lower Macungie area. We will scan and return them if you like. Yes, I would like to donate to the LMTHS Museum Fund! The LMTHS is a 501(c)(3) charitable organization. When you #StartWithaSmile, Amazon donates 0.5% of the purchase price to Lower Macungie Township Historical Society. Bookmark the link http://smile.amazon.com/ch/23-2656813 and support us every time you shop.